One of the best things about my trip to Berlin with my 18 year-old daughter was the food that we ate there. (You can read about what we did on our trip in my post Itinerary for a three-night Berlin sightseeing trip with a teenager.) I don’t eat meat and my daughter’s vegan (meaning that she doesn’t eat any animal products) and before the trip she researched places to eat in the city. She did a really good job, and I would definitely recommend everywhere that we ate. Some of the places only served vegan and vegetarian food, while others offered vegan food as an option. We don’t speak German, but all of the places had menus available in English and/or English-speaking staff who helped us. I’ve included the price that we paid for the two of us for each meal. Hummus & Friends is near Alexanderplatz, next door but one to the New Synagogue, which is one of the city’s most important Jewish landmarks. 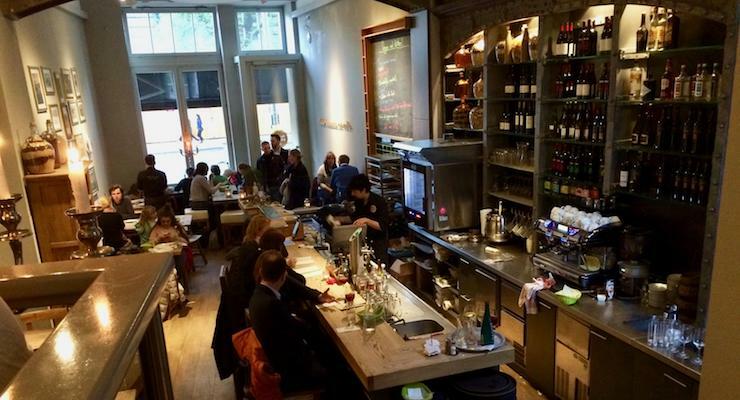 The food is kosher and vegetarian, with a lot of vegan options, and the atmosphere is friendly and bohemian. When we went there for dinner the restaurant was very busy and we only just got a table – people arriving after us were turned away. Our cheery, helpful waiter helped us to decide what to eat. We shared a main dish of hummus and chickpeas with two pittas, and side dishes of roast aubergine and roast cauliflower, each served with hummus, and we drank mineral water. It was all very tasty and filling. The excellent restaurant motto, shown in clear, neat letters on the wall and on the back of the staffs’ shirts, is ‘Make hummus not walls’. I love this even more than the yummy food. 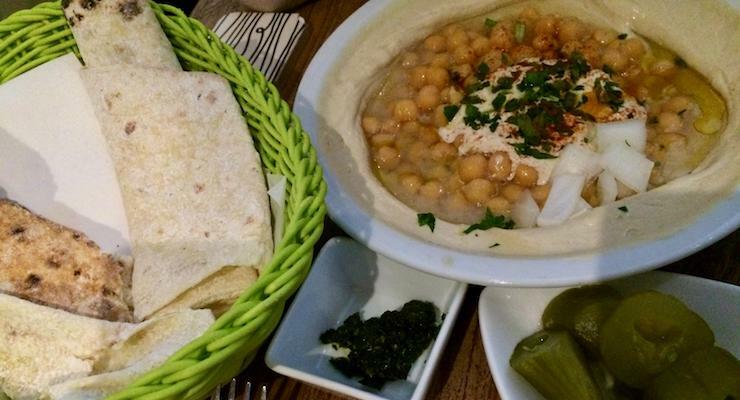 Hummus & Friends, Oranienburger Strasse 27, 10117 Berlin. 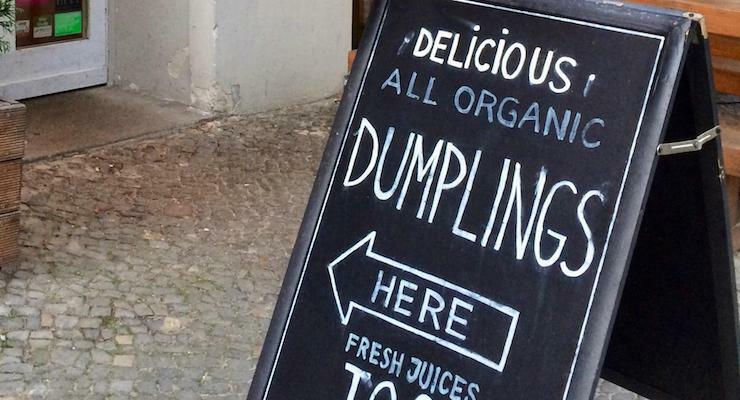 Momos is a tiny restaurant which specialises in homemade, organic, vegetarian dumplings. But if the word ‘dumplings’ makes you shudder and gives you horrific school dinner flashbacks (as it does for me), clear your mind. These dumplings are a whole different thing. They look like tiny Cornish pasties, and they are delicious. Momos is on a quiet street in the Mitte district of the city, and has just three tables inside and a couple outside. We sat inside, by the window, and ordered a vegan Momo Experience to share, on the chef’s recommendation. The Momo Experience is a mixture of steamed and pan-fried dumplings with three different homemade dips. The chef cooked our dumplings to order and was very friendly and helpful. The drinks on offer at Momos are provided by LemonAid and ChariTea, who support community projects in the developing world. I had a rooibos and passionfruit ChariTea and my daughter had a passionfruit LemonAid, and they were both very good. Cost: € 13,90 for two. Momos, Fehrbelliner Strasse. 5, 10119 Berlin. 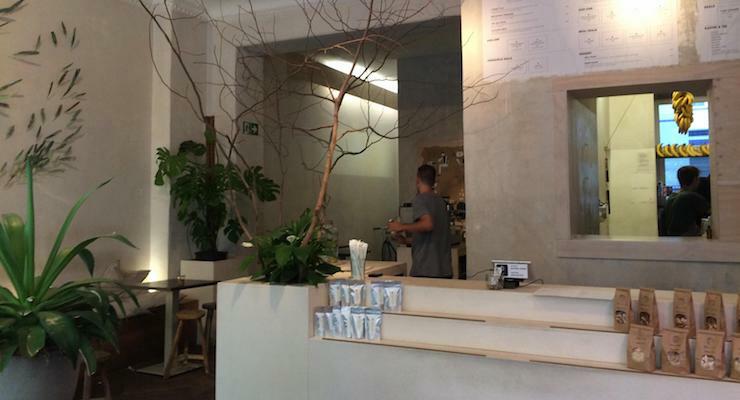 Daluma is a vegan health-food cafe on Rosenthaler Platz in the Mitte district. It has an airy, minimalist interior and friendly helpful staff, and offers wholesome, healthy and delicious food for breakfast and lunch, to eat in or take away, as well as drinks, such as cold pressed juices and smoothies. We liked it so much that we had lunch there twice. On our first visit I had ‘Oriental Study’ which the menu describes as ‘turmeric cauliflower with tabbouleh and chickpea salad on a mango curry, hummus with baby romain, roasted eggplant, almonds, tahini, lemon, coriander and beluga lentils.’ My daughter had ‘Southern Garden’ which the menu describes as roasted zucchini and eggplant with arugula and cherry tomatoes on a salsa roja with pine nuts, olives, pickled onions and capers on red rice and quinoa. You can help yourself to tap water flavoured with slices of cucumber, lemon and lime from a container on the counter. 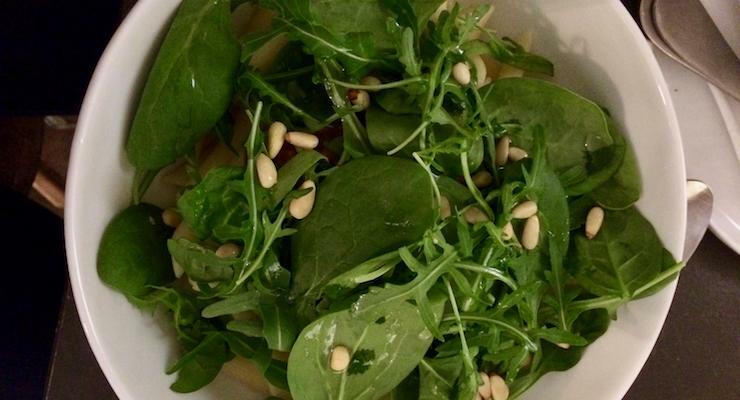 On our second visit we both had organic pasta with cherry tomatoes, arugula, baby spinach and pine nuts with a fresh tomato sauce. My daughter had half an organic avocado with her pasta dish. Cost: Our first lunch cost €17,30, the second cost €18,40, for two. Daluma, Weinbergsweg 3, 10119, Berlin. 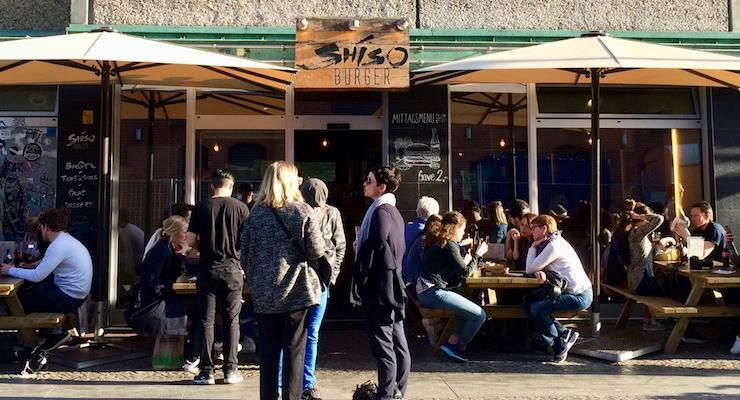 Shiso Burger is an upmarket burger restaurant in Berlin Mitte with an open kitchen offering burgers with an Asian twist. Most of the menu is for meat-eaters, but it also features a salmon burger, a veggie burger and a ‘toad’ burger (it doesn’t contain an actual toad, obviously, but a large mushroom topped with cheese, onion and lettuce). We arrived at Shiso Burger at about 5.30pm, as we were hungry after an early start to catch a flight. We hadn’t thought of reserving a table, but we were lucky to get one, as most of the tables were full, both inside and out. Our table was inside, next to the kitchen. We both had a Toad Burger (my daughter’s was without cheese), with homemade fries. It was all freshly cooked and very tasty. We drank tap water, but the waitress would only give us one tiny glass each, which seemed a bit mean. 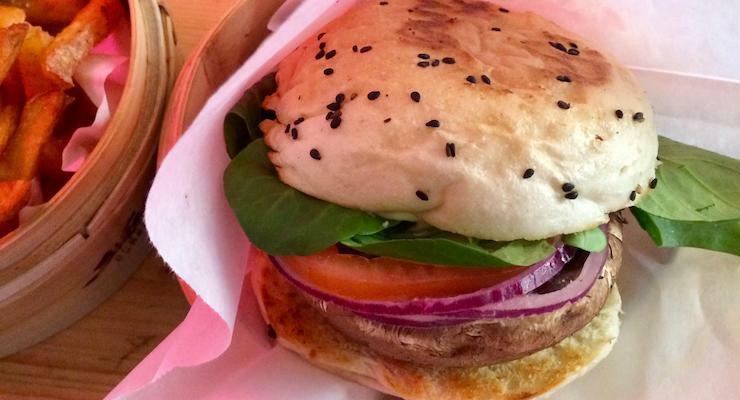 Shiso Burger, Auguststrasse 29c, 10119, Berlin. 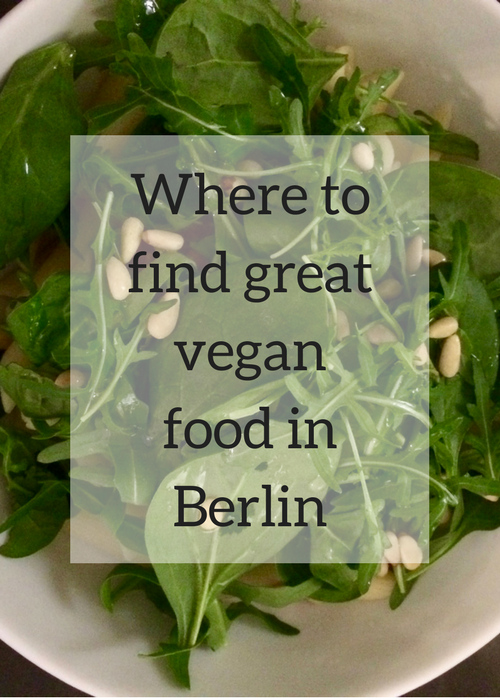 If you find yourself in search of something vegan and you’re in, or near to, the enormous Mall of Berlin on Potsdam Platz, head upstairs to the shopping mall’s Food Court. 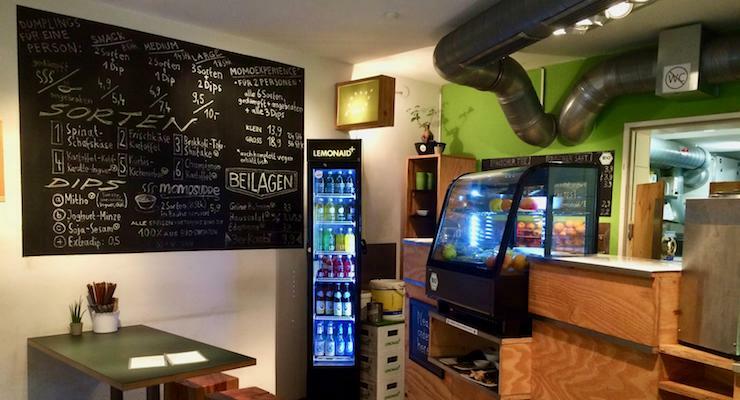 There you will find Boussi falafel, a very good vegetarian falafel place with lots of vegan options. My daughter had a falafel pitta and I had a halloumi pitta, which the friendly staff prepared and cooked to order in front of us. We each had a Coke Zero to go with our pittas, and we ate at one of the tables nearby. 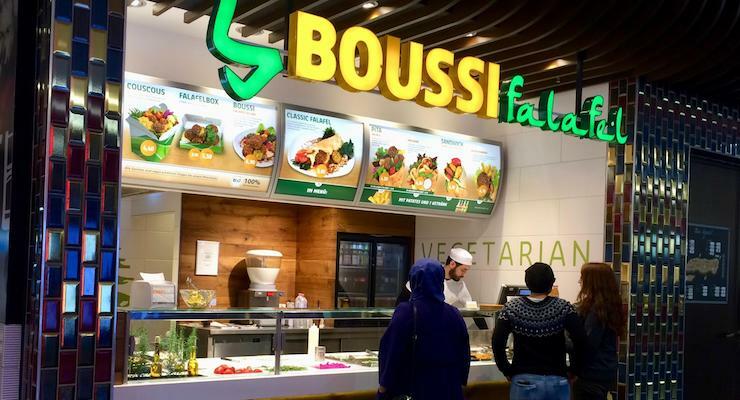 Boussi falafel, Mall of Berlin, Vosstrasse 35, 10117 Berlin. Dean and David serves fresh and healthy salads, soups, Thai curries, sandwiches, juices and smoothies. They have branches across Germany as well as in Switzerland and Luxembourg – we had lunch at the one near Berlin’s DDR Museum, and it was a welcoming and relaxing place. I had a tomato and mozzarella sandwich and my daughter had a vegan sandwich, both of which were made to order. We shared a bottle of water, and we sat at a table inside to eat. Dean and David, Karl-Liebknecht-Strasse 7, 10178, Berlin. Shiloh is a vegetarian and vegan kosher café on Torstrasse. We were planning to have lunch at Shiloh before our flight home, but when we got there it was closed for Passover, so we went to Daluma instead. So I can’t recommend Shiloh to you, but I’m including it here because it does sound like a good place to eat. If you’ve been, do let me know what it’s like. Verdict and cost: I’m not sure – let me know if you go there! Shiloh, Torstrasse 159, 10115 Berlin. We stayed at the Ibis Styles Mitte, which worked well for us, and which I’d recommend as a good base for a sightseeing trip. You can book it here. Do you have any recommendations for great places to eat in Berlin? Would you like to try any of these places? Thank you Jo, it was all delicious. 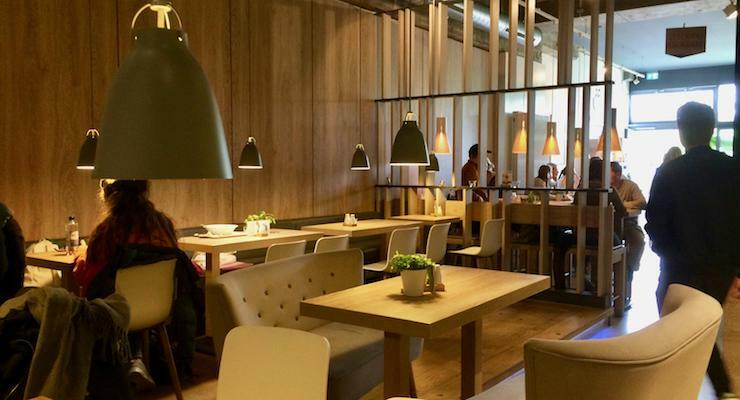 Vaust – an excellent vegan and organic micro-brasserie! I would love to try out these places. The food looks delicious. Thank you for sharing. I had a meal at Momo long long time a go. Very fresh and original tasting.